Haus Wachenfeld during its conversion into the Berghof in about June 1936. Seventy years later the site was overgrown by trees and only scattered rubble along with the top of the retaining wall at left were still visible. The Berghof was Adolf Hitler's home in the Obersalzberg of the Bavarian Alps near Berchtesgaden, Germany. Other than the Wolfsschanze in East Prussia (now in Poland), Hitler spent more time at the Berghof than anywhere else during World War II. It was also one of the most widely known of Hitler's headquarters which were located throughout Europe. Rebuilt, much expanded and re-named in 1935, the Berghof as such was a functioning residence for less than ten years. In late April 1945 the house was damaged by British aerial bombs, set on fire by retreating SS troops in early May and looted after Allied troops reached the area. The burnt out shell was demolished by the West German government in 1952. Map showing the location of the Berghof, along with Führer Headquarters throughout Europe. The Berghof began as a much smaller chalet called Haus Wachenfeld, a holiday home built in 1916 by Otto Winter, a businessman from Buxtehude. Winter's widow rented the house to Hitler in 1928 and his half-sister Angela came to live there as housekeeper (she left soon after her daughter Geli's 1931 death in Hitler's Munich apartment following a stay at the house). By 1933 Hitler had purchased Haus Wachenfeld with funds he received through the sale of his political manifesto Mein Kampf. The small chalet-style building was refurbished and much expanded during 1935-1936 when it was re-named The Berghof. A large terrace was built and featured big, colourful, resort-style canvas umbrellas. The entrance hall "was filled with a curious display of cactus plants in majolica pots." A dining room was panelled with very costly cembra pine. Hitler's large study also had a telephone switchboard room. The library had books "on history, painting, architecture, and music." A great hall was furnished with expensive Teutonic furniture and a large globe along with an enormous red marble fireplace mantel. Behind one wall was a projection booth for evening screenings of movies (these were often Hollywood productions which were otherwise banned in Germany). A sprawling picture window could be lowered into the wall to give a sweeping, open air view of the snow covered mountains in Hitler's native Austria. The house was maintained much like a small resort hotel by several housekeepers, gardeners, cooks and other domestic workers. Adolf Hitler and Eva Braun with their dogs at the Berghof. British Homes & Gardens magazine characterized him as "his own decorator, designer, and furnisher, as well as architect" and described the chalet as "bright and airy" with "a light jade green colour scheme," noting caged "Hartz mountain [sic]" canaries were kept in most of the rooms which were furnished with antiques, mostly German furniture from the eighteenth century. Old engravings hung in the guest bedrooms, along with some of Hitler's small water-colour sketches. His personal valet Heinz Linge stated that Hitler and his longtime companion Eva Braun had two bedrooms and two bathrooms with interconnecting doors and Hitler would end most evenings alone with her in his study drinking tea. Smoking was allowed on the terrace (the householder didn't smoke). Hitler's vegetarian diet was fed by nearby kitchen gardens and later, a greenhouse. A Kehlsteinhaus, nicknamed Eagle's Nest by a French diplomat, was built in 1938-1939 (with remarkably lavish government funds spent as a national gift for his 50th birthday) on the mountaintop above the Berghof, but Hitler rarely went there. A large complex of mountain homes for the Nazi leadership along with a landing strip and many buildings for their security and support staff were constructed nearby. To acquire the land for these projects, many local residents were ordered to sell out and leave. The Berghof became something of German tourist attraction during the mid-1930s with crowds gathering at the end of the driveway or on nearby public paths in the hope that they might catch a glimpse of the Führer. This led to the introduction of severe restrictions on access to the area along with other security measures. A large contingent of the SS Leibstandarte Adolf Hitler were housed in barracks adjacent to the Berghof. Under the command of Obersturmbannführer Bernhard Frank they patrolled an extensive cordoned off security zone that also encompassed the nearby homes of the other Nazi leaders. With the outbreak of war extensive anti-aircraft defences were also installed, including smoke generating machines to conceal the Berghof complex from hostile aircraft. Guests at the Berghof included political figures, monarchs, heads of state and diplomats along with painters, singers and musicians. The important visitors personally greeted on the steps of the Berghof by Hitler included; David Lloyd George (3 March 1936), the Aga Khan (20 October 1937), Duke and Duchess of Windsor (22 October 1937), Kurt Schuschnigg (12 February 1938), Neville Chamberlain (15 September 1938) and Benito Mussolini (19 January 1941). At the end of July 1941 Hitler summoned his military chiefs from OKW and OKH to the Berghof for the 'Berghof Conference' at which the 'Russian problem' was studied. Hitler's social circle at his Berghof retreat included Eva Braun and her sister Gretl, Eva's friend Marianne Schönmann, Herta Schneider and her children, Heinrich Hoffmann and the wives and children of other Nazi leaders and Hitler's staff who would all pose for an annual group photograph on the occasion of Hitler's birthday. The social scene at the Berghof ended on 14 July 1944 when Hitler left for his military headquarters in East Prussia, never to return. After the war Hitler's adjutant Otto Günsche told Soviet interrogators how Braun had once wanted to hire ten more serving girls to help the 30 people already working in the villa. Hitler relayed her request to his secretary Martin Bormann by exclaiming, "I stamp whole divisions into the dirt! And I can't get a few more serving wenches for the Berghof? Organise it now!" Silent colour movies shot by Eva Braun survived the war and showed Hitler and his guests relaxing at the Berghof. In 2006 computer lip reading software identified several parts of their conversations. Among those identified in the films were Albert Speer, Heinrich Himmler, Joachim von Ribbentrop, Joseph Goebbels, Karl Wolff and Reinhard Heydrich. Two guests planned to use a visit to the Berghof as an opportunity to assassinate Hitler. On 11 March 1944 Captain Eberhard von Breitenbuch arrived with a concealed pistol with the intention of shooting Hitler in the head, but guards would not allow him into the same room. On 7 June 1944 Colonel Claus Schenk Graf von Stauffenberg planned to detonate a bomb at a meeting there, but his fellow conspirators would not give him approval to do so because Himmler and Hermann Göring were not also present. There was also a British plan called Operation Foxley for a sniper to kill Hitler on his daily walk from the Berghof to the Teehaus. In 1937 a Teehaus with a round main room was built in a wooded area on Mooslahnerkopf hill (Braun spelled it Moslanderkopf in photo albums), across the small Berchtesgaden valley from the Berghof. Hitler took an almost daily afternoon walk there when he was at Berchtesgaden. The stroll along the mostly wooded path between the Berghof and the teahouse was less than a kilometer and at one spot featured a scenic overlook of the whole valley, fitted with wooden railings and a bench, where many widely-known photographs were taken and political discussions were held (in 2004 this site was somewhat restored to its early 1940s era appearance for a German television mini-series). At the teahouse Hitler might even nap in an easy chair, surrounded by friends and associates from his inner circle. Most of the few surviving photographs of Hitler wearing eyeglasses were taken in the teahouse. Some sources have now and then mistakenly captioned photographs snapped in the Mooslahnerkopf Teehaus as having been shot in the spectacular Kehlsteinhaus far above the Berghof, where Hitler seldom went. The Obersalzberg was bombed by hundreds of British Lancaster bombers, including aircraft from No. 617 Squadron RAF ("The Dam Busters"), on 25 April 1945, twelve days before the surrender of German forces on 7 May. At least two bombs struck the Berghof. On 4 May, four days after Hitler's suicide in Berlin, departing SS troops set fire to the villa. Only hours later the U.S. 3rd Infantry Division arrived at Berchtesgaden along with the French 2nd Armoured Division. The Americans reportedly muddled Berchtesgaden with the Berghof and a French army captain along with his driver were the first Allied personnel to reach the still smoldering chalet. A French tank crew soon joined them. Over the next few days the house was thoroughly looted and stripped, apparently by Allied soldiers. The American 1st Battalion of the 506th A regiment (led by Company C) arrived four days later, on 8 May. The 3rd battalion of the 506th came into Berchtesgaden by a different route and sustained casualties in a skirmish with the crews of two German 88 mm guns. The teahouse on Mooslahnerkopf hill was unscathed in the April 1945 bombing raid but by 1951 the house-sized building had been knocked down by the Bavarian government because of its link with Hitler. For 55 years the more or less recognizeable teahouse ruins (along with mostly intact basement rooms below) lay in the woods by the 13th hole of the post war Gutshof (Manor farm) golf course. These were taken away altogether during the late summer of 2006. The Berghof's shell survived until 1952 when the Bavarian government blew it up, fearing the ruin would become a neo-Nazi shrine and sight-seeing attraction. The garage remained until 1995. The ruins were further obliterated during the 1990s and early 2000s. By 2007 trees had overgrown the site and only scattered rubble and the top of a retaining wall were visible. 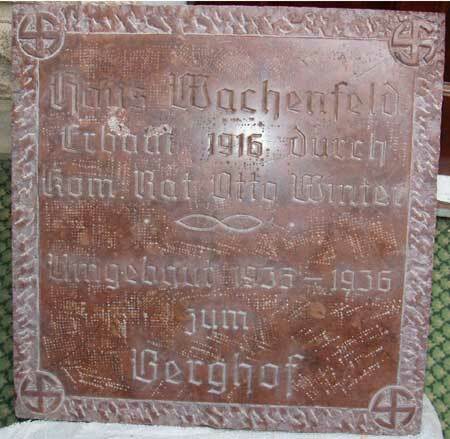 ^ Image of looted red marble "cornerstone" from the Berghof, English translation: Haus Wachenfeld. Built 1916 by... Otto Winter - Refurbished 1935-1936 to the Berghof. Note however: Image source is not considered a reliable secondary source of editorial content so only the photographic image itself is cited, as a primary source and then only for basic, unremarkable information which helps date the house. A few sources cite Wachenfeld as Frau Winter's maiden name. ^ Phayre, Ignatius, Homes and Gardens, Hitler's Mountain Home, November 1938, retrieved 12 December 2007 - Most of these descriptions come from this 1938 magazine article which was very likely written under a pseudonym by political writer William George Fitzgerald in a tone which has been described as "breathless... Hello!-style." The photographs had all been taken by Heinrich Hoffmann (many of them years earlier) and given to the magazine as publicity handouts. The article happened to surface in 2003 after decades of obscurity, see the Guardian reference below. ^ Heinz Linge, Roger Moorehouse (2009). With Hitler to the End: The Memoir of Hitler's Valet. Skyhorse Publishing. ISBN 1-602-39804-6. ^ Ian Kershaw (2000). Hitler 1936-1945: Nemesis. Penguin Press. ISBN 0-393-32252-1. Don't Mention the War, The Sydney Morning Herald, Gary A Warner, August 18, 2006.